Tomato contains large amount of lycopene, an antioxidant highly effective in fighting with cancer causing free radicals.Tomato is a natural antiseptic therefore it can help protect against infection .Nicotinic acid in tomatoes can help to reduce blood cholesterol, thus helps prevent heart diseases. It is a rich source of vitamins and minerals. It also improves eye health and prevents hypertension and urinary tract infections. Wash Tomatoes well.Cut into pieces. Grind the tomatoes without water and keep it aside. Heat 1 tbsp of ghee in a non stick pan.Add Tomato Juice ,Cardamom Powder and Sugar and stir it in low heat. In middle add more ghee. Add corn flour mixed in little bit water. Stir continuously till it becomes soft and thick. Garnish it with Almonds and Pistachios. Delicious and tangy Tomato Halwa is ready . innovative halwa. looks so yummy!! New halwa recipe looks beautiful! wow!!!! never heard of this looks yummy. 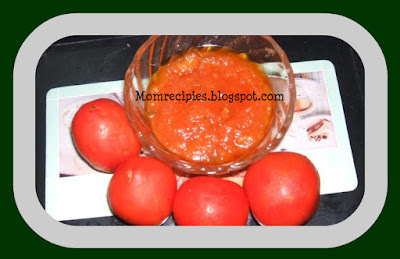 Mom used to make tomato jam first time i hear about halwa, love the colour too. Halwa looks cute. nice recipe. 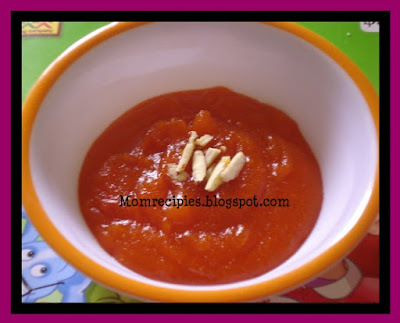 never heard of tomato halwa but the recipe looks yummy and interesting.It is nice to try . Eye catching and delicious halwa! nice colour and looks delicious.. Very nice, innovative and delicious dish. I will definitely try your recipe. Wow.. Sounds so new to me..Heard abt tomato jam, but not halwa!! New halwa and nice colour. hi ..halwa looks gr8..do visit my blog..i too have a posting for tomato halwa.. I have never eaten a tomato halva. This is a very interesting recipe.